Wolfgang von Wangenheim. Das Basler Fragment einer mitteldeutsch-niederdeutschen Liederhandschrift und sein Spruchdichter-Repertoire. Bern/Frankfurt a. M. 1972. Sung in Middle High German. and words with German and English summaries (6 pp) bound in album (LP). The term Spruchdichtung is not medieval in origin, but was invented by the German philologist Karl Simrock in 1838. 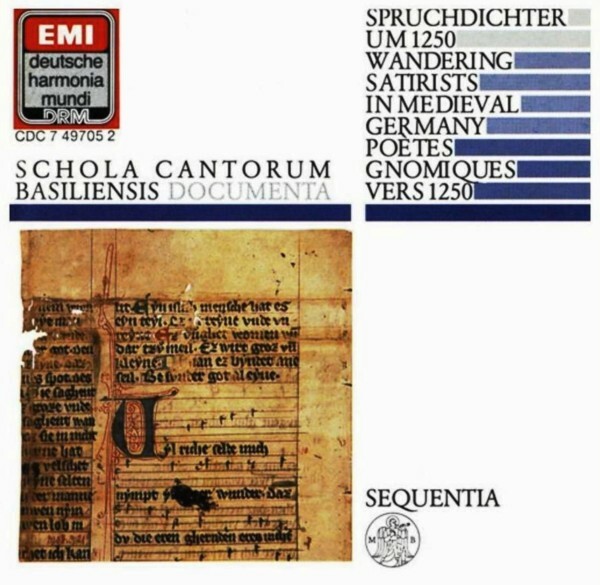 As a concept which has remained controversial to this day, Spruchdichtung refers to Middle High German poetry of a religious or political nature, as well as to verses dealing with questions of morality, ethics, artistry, etc. Thus, in its subject matter, it presents a contrast to the love poetry of the period. The strophes of the Spruchdichter (the poets who composed and often performed Spruchdichtung), like those of the love poets, were meant to be sung. In order to express this common feature while at the same time retaining the concept of Spruch — a term which has since become established — philologists have employed the somewhat unusual terms of Sangspruch, Spruchlied, or Liedspruch (all of which translate literally as “spoken song”). The Spruchdichter, who belonged to the class of itinerant professional artists, were financially dependent upon the favour of their patrons, employers, and an ever-changing public. On the other hand, these same patrons — secular and ecclesiastical princes of varying degrees of importance, as well as an increasingly wealthy urban merchant class — needed the Spruchdichter, who were known to exercise a certain “journalistic” power over their employers. A patron's public image and reputation depended to a considerable extent upon these travelling singers. Thus, each party benefitted from the other. Although many singers repeatedly assert that their artistic integrity is not for sale, and that their opinions are therefore incorruptible and just, we can in most cases assume that — as in any other period of history — songs were sung in praise of whomever provided the “bread”. It is no coincidence that the first formulation of this idea (which subsequently became a German proverb) is attributed to a Spruchdichter. Not only were the Spruchdichter dependent upon their rich and powerful superiors, but they also had to continually maintain their distance from troublesome competitors and from those travelling minstrels who were mere entertainers: singers and instrumentalists who performed others' works, fire-eaters, etc. The Spruchdichter themselves — like their colleagues, the love poets — were not only poets, but composers and performers as well, rarely making use of pre-existing melodies. Little is known about the social-milieu and background of the Spruchdichter. However, they all seem to have had the dream of finding a permanent patron, becoming settled, and obtaining a secure position as a court singer of sorts. We only know of a few poets (e.g. Walther von der Vogelweide, Tannhäuser, Neidhart, Heinrich von Meissen, who was known as “Frauenlob”) who actually attained these goals, whether permanently or temporarily. There were apparently no aristocratic or financially independent authors among the Spruchdichter. Wealthy and noble poet/composers were not rare, but their output consisted almost exclusively of love songs. Renaissance, many of the forms and themes of Spruchdichtung were taken over by the urban Meistersänger and developed further within the artistic context of their guilds. A definite turning-point in the history of Middle High German strophic poetry — love poetry as well as Spruchdichtung — is found in the early 14th century. This turning-point was clearly recognized at the time, for everything available was collected in large manuscripts, thus documenting the fact that a generally-acknowledged poetic era had come to a close. Almost nothing is known about the personal lives of the numerous authors of Sangsprüche from the 12th to the early 14th centuries. Only their texts and melodies, their names and, very rarely, a reference to one of them in the accounts of a prince or a city have survived the passage of time. Today, therefore, information about their lifestyles, travels, ever-changing employers and audiences, their function and reputation must be painstakingly elicited from the poetry itself, together with all the errors that such a procedure entails. This also holds true for Kelin and Fegfeuer. From occasional textual allusions by the poets themselves and from the documentation of their works, one can assume a period of activity between the middle of the 13th and the beginning of the 14th centuries. It can also be learned that they belonged to the “class” of itinerant professional singers described above, and that Kelin spent most of his life in Southern Germany and Austria. We can assume that Fegfeuer (“Purgatory”) is an expressive pseudonym — it was not uncommon for a poet of the period to choose such a stage-name for himself. It is apparent from their poetry that neither Kelin nor Fegfeuer had an easy life, but rather had to fight for recognition and sustenance. Their function was to entertain their listeners, to keep them abreast of current events and issues, to instruct them on Good and Evil, to scold them whenever possible, and to praise them whenever necessary. Like other Spruchdichter, Kelin and Fegfeuer were, in their way, singing publicists, news distributors, commentators, moralizers, and lay preachers. They were in many respects similar to the Liedermacher (“song makers”) of today, who of course make frequent references to their medieval “ancestors”. Unfortunately, we have no clear idea of the manner in which Spruchdichtung was performed, nor do we know for certain the circumstances under which performances were given. We can only piece together bits of information — as in a jigsaw puzzle — from various sources, such as allusions and remarks made by the poets themselves, inconographical material, historical chronicles, etc. Performances probably took place in the numerous castles and courts of varying size and importance, as well as in the cities which were beginning to play an increasingly important economic role at that time. It is likely that the singers most often appeared in connection with some festivity; occasionally they might also have pursued their profession in the market places or taverns. Depending upon the occasion — it must be supposed — they performed their works alone, possibly accompanying themselves on an instrument, or they may have performed together with one or more instrumentalists or singers (including women!). 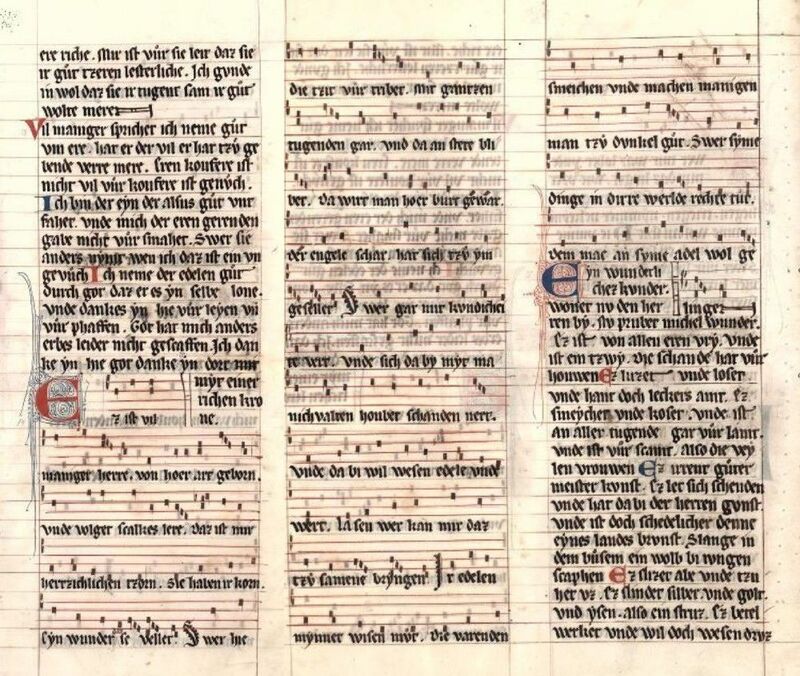 It is known that in the late Middle Ages singers varied the order, length, and sometimes even the wording of their songs and strophes, depending upon their audience for any given performance. In this way they were able to heighten the effectiveness of the poems, include items of topical interest, and avoid possible bones of contention. An all too abrasive provocation of the audience, particularly of the mighty nobles, could have dangerous consequences. 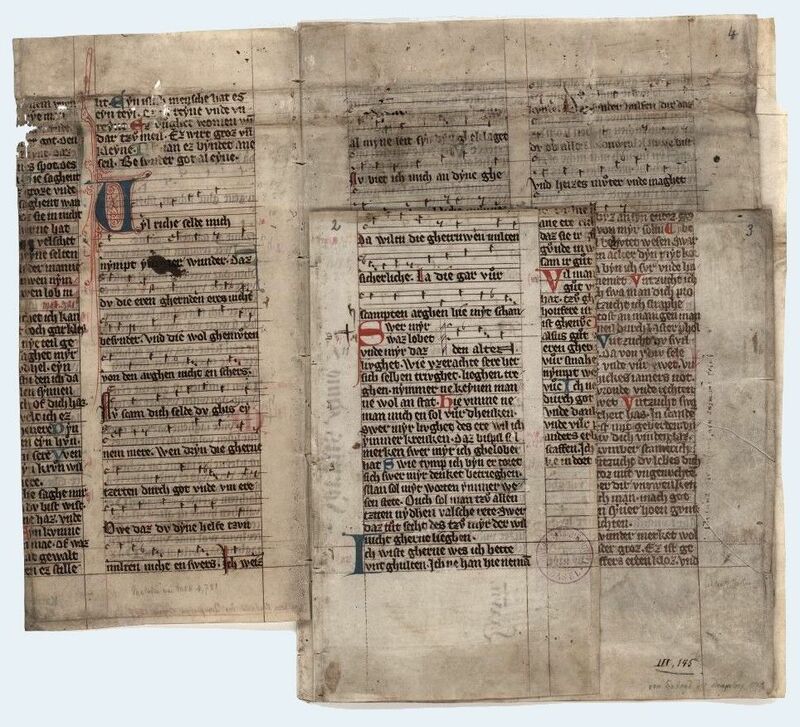 The melodies and texts by Kelin and Fegfeuer have been transmitted with some minor variants in two vellum manuscripts from the first half of the 14th century, in the “Jenaer Liederhandschrift”, and in a fragment which is now located in the Universitätsbibliothek in Basel. Both manuscripts were written in Northern Germany. The Jena manuscript is exceptional in a number of respects, in its size (56 x 41 cm. ), its length (133 extant pages) and its rich contents, consisting of 91 melodies and 940 strophes; it is by far the most important source for the Spruchdichtung of that epoch. Only a prince could have commissioned such an expensive manuscript (E. Pickerodt-Uthleb suggests Rudolf I, Count of Saxe-Wittenberg, 1298-1356). In 1558, it was donated from the Electoral Saxon library to the Universitätsbibliothek in Jena (where it has had the call number Ms. El. f. 101 since 1980). One cannot determine the original length or history of the small fragment in Basel (the original size was 28 x 21 cm. or slightly larger). It is clear, however, that the texts from which these two manuscripts were copied must have been closely related. The idea that a work should never be varied, that it should be kept as close as possible to its original version in all performances was foreign to the medieval mind. The Sangspruch singer — as mentioned above — had to adapt himself to various audiences and performance situations. If his colleagues added one of his songs to their repertory, then further changes and adaptations could occur. For example, three of Kelin's strophes appear with major variants in the work of a fellow singer by the name of Der Marner. It is no longer possible today to determine who wrote the original version. Performing conditions probably dictated the programme order and manner in which the strophes were combined, and musical performance was characterized by a high degree of improvisation. In the manuscripts of that period only the pitches of the melody were notated. (In the Basel and Jena manuscripts they are notated on the four-line staves typical for the time.) The rhythm, tempo, style of instrumental accompaniment, vocal tessitura and expressive character were not indicated. These factors were probably taken for granted within the performance traditions of the time and, in addition, their realization was dependent on the specific circumstances. The modern performer has to come to terms with the apparent openness and lack of precision of the extant sources and attempt to rediscover the tradition for his own performing version. Like the medieval singer, he has to put together his own performance programme from that which is available in the transmitted texts. In the case of Spruchdichtung, he is not necessarily bound to follow the strophic order of the manuscripts. He even has the freedom (or on occasion is faced by the necessity) of subdividing those texts which are hanged down as a Ton (i. e., a group of strophes with the same metric structure and the same melody) into several units for performance, as has been done on this recording with Fegfeuer's Ton I. There is no way of categorically establishing here — this must be explicitly stated — what is “right” and what is “wrong”. The modern performer has similar freedoms in choosing how to execute the piece musically; he will, of course, take current musicological research into consideration. It must also be emphasized that there is no “correct” pronunciation of Middle High German today, although such claims are frequently made. In the Middle Ages, there was no standard orthography or pronunciation (comparable to stage German); instead, there were more or less distinct regional differences. Poets, singers, and scribes needed to be understood in various dialect regions so as not to appear foolish in front of their audiences. In modern performances, it is advisable to make the Middle High German phonetics approach those of Modern High German, to avoid all affectations, and to concentrate on the following features: the vowel length is to be observed even when it deviates from Modern High German (as in e/ê); /iu/ is to be pronounced as a long ü, while all other groups of two vowels (for example, uo, üe, ie) are to be pronounced as diphthongs with an accentuation on the first sound; at the beginning of a word and following a consonant the letter z corresponds to the z in Modern High German, between vowels and at the end of words, however, it is (usually!) a voiceless s.
On the performance of the Spruchdichter repertoire. The initial impulse to study and perform this repertoire was provided by our contact with the so-called “Basler Fragment” (Universitatsbibliothek Basel), which provides texts and melodies for several pieces by Kelin and Fegfeuer. (The Jenaer Liederhandschrift contains those texts and melodies which are missing or incomplete in Basel). Little is known about the musical practices of the Spruchdichter. The Spruchdichter made use of a melody (“Weise”) as a vehicle for the rendering of various combinations of strophes, chosen to suit specific audiences or occasions. Often one melody was used to set totally unrelated strophes, thereby yielding two or more entirely different “songs” within the same “Ton” (totality of strophes). This principle is demonstrated here in Fegfeuer's Ton I. The Spruchdichter's art is deeply rooted in the texts and their declamation through the medium of the “Weise”. The instrumental accompaniment styles used here range from simple bourdon to melodic elaboration, but all have in common the function of providing tonal coherence, mood, and a framework upon which the texts can rest. The instruments employed — especially fiddle, flute and harp — are commonly associated with professional minstrels in 13th-century Germany. 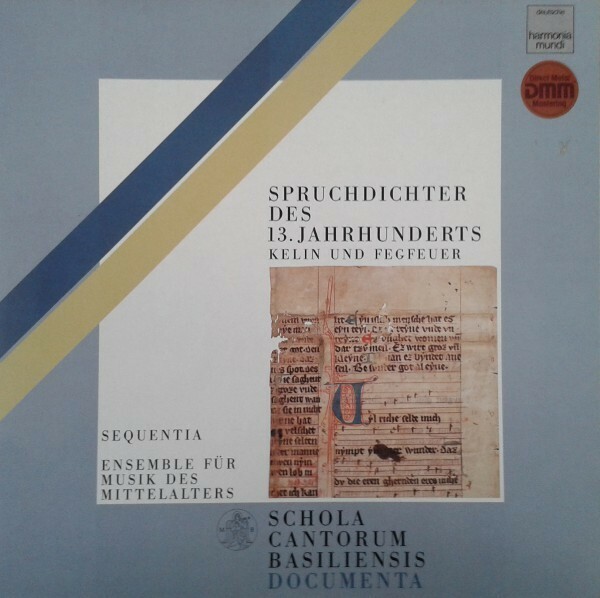 Unfortunately, there is no extant instrumental music from the milieu of the Spruchdichter. The reconstructions on this recording are based on the melodic/gestural vocabulary of Kelin and Fegfeuer, expanded and adapted to the instrumental idiom, using polyphonic and heterophonic playing techniques which would have been part of the unwritten tradition of the 13th-century spîlman. In this song, Kelin shows his concern for certain social injustices perpetrated upon the travelling musician of his day. He initially addresses his discontent to a feminine figure, Sælde, whom we are to understand as a sort of Fortuna: she is that blind force who directs men's fates towards success or failure, happiness or unhappiness, regardless of their true intentions, efforts or even honour. He upbraids her, for she seems to smile down upon miserly patrons more than upon the generous. Surely, says the poet, being a heavenly personage, she intends to reward the deserving in heaven rather than here on earth. Well then, let the niggardly grow old here in their stinginess! In the second strophe, Kelin erupts in anger, against those who do not keep their word. Surely, he is referring to a specific incident of promised payment for his services which was not delivered. The third strophe is sarcastic and specific in its critique of patrons. He praises the generosity of lords elsewhere, leaving us to draw our own conclusions about the patrons in this place. Finally, Kelin puts aside his anger and sarcasm by demonstrating his moral superiority: it should not be thought that the patron gives to him (in money or goods) in exchange for his honour, but rathes that he, as the true artist, shares his honour with his patron by honouring him in verses. The true patron will find himself honoured on Judgement Day for having recognised an honourable poet (Kelm, of course) in this life. The same Ton which carries the text “Mâriâ, muoter unde maget” is found here with a text of bitter social commentary. In the manuscript source, none of these strophes occur together amongst the 16 strophes of the Ton, but grouped as a unit they form a thematic whole, addressing an artistic/social problem of great importance to Fegfeuer: the true artist and his role in the social structure under the hêrren at court. He deplores the anti-varnden prejudices amongst the lord's arrogant, sycophantic courtiers. The court ought to be honoured by a singer's presence, he says, and so he decides to compete with the monks in trying to influence the young noblemen. Fegfeuer laments his lack of friends and supporters. In spite of all his efforts, he's left with empty promises, “nutshells”, and asks himself why he is wasting his time in this unfriendly place. He can't find an honest, pure courtly society; most courtiers have no respect or worth, and deserve only to be criticized in verse for their shameful ways. But, luckily, the patron who has generosity (milte), can rejoice in God's presence, whereas the shameful, greedy ones (kargen) will meet a fiery, sharp sword at the Last Judgement, which will send them to the depths of Hell. Finally, Fegfeuer reminds us of his dependence on good will, which ultimately comes from God, but reaches the poor poet through the generous hêrren. If he were born rich, he wouldn't have to endure such miserable winters amongst the varnden at court! This is clearly a song meant to entertain an audience of sympathisers and like-minded colleagues, who would not miss the veiled insults and warnings hurled — in absentia at a notoriously stingy, unnamed patron. The strophes chosen here from Kelin's Ton I deal once again with the moral value of art. The first strophe describes a “king's dream” (a reference to Nebuchadnezzar's dream in Daniel 2,31). This king sees three “worlds” Dr Zeitalter, one of gold, having the highest value, one of purest silver, and one of iron. The king awakens suddenly after his vision of iron, and just as abruptly, the poet brings us into the present. The metal he would choose to characterize the present would be copper: from the outside it looks like gold, but its true value can only be known in the testing. A similar theme is treated in the second strophe: valsche hunde are easily discouraged on the hunting trail, and do not follow the rechte vart (“correct path”), or “true art”. The rechte hund (“true dog”) is the true poet who practices his art honourably. In the third strophe Kelin lashes out against dishonourable artists, whose self-esteem outdistances by far their ability as poets, calling them all sorts of unflattering names. As if to counter this image of a despicable craftsman, Kelin conjures up a vision of the Master Craftsman of the Universe: Christ. A last riddle is posed to end the song, which places the themes of power, kingship and divinity in a new context [What who “ing”] is as powerful on land as on sea, who never rests and is both pure and impure, is not bound by anything, yet is part of every person? The answer: Wind, or breath. The four strophes of this Ton make revealing, light-hearted comments about the Spruchdichter's social status — or lack of same — in the uncertain world of the varnden. Beginning with the statement that “Arabian gold is good!”, Fegfeuer proceeds to complain about hêrren who won't part with their possessions (especially their gold), and therefore deserve no praise. It is useless for the stingy host to hide his treasures when guests arrive, because Death will catch him in his shame, and his widow will then marry an honest man who knows how to share the wealth. The listener is taught the difference between an honest and heartfelt invitation to dine (“You must eat with meª”), and a shameful, unpromising one (“Would you like to ...?”). The good host is reminded to be generous. Finally, we are given a glimpse of good-natured rivalry amongst the Spruchdichter, as Fegfeuer complains about the success which colleague and rival Meissner is currently enjoying. This collection of strophes taken from Fegfeuer's Ton I is unified by the image of the poet's nom de plume: Purgatory (= Fegfeuer). The strophes all have a visionary cast, and reiterate the theme of the Christian soul in its tormented state. The first strophe begins in mid-action, as it were, with an anguished crying out of the soul to the Virgin Mary. She is supposed to have a special relationship to sinners; she is mother yet maiden, human, yet begetter of Christ. The second strophe goes on with verses about Christ as judge on the Last Day. Much of the language is apocalyptical (“Er was nicht, ê in got geschuof ...”). The “engel ruof” refers to Christ's coming as judge, heralded by angels. Kelin's description of the manner in which the dead shall be judged on that day (2nd Stollen) comes directly from the Apocalypse (20, 12 and 22, 12), and he counts himself among all men who live in continual fear of Judgement. Next, we enter a visionary world, in which five “cloisters”, or dwellings stand ready for mankind: That of the layman, that of the monk, marriage, and Purgatory (through which “God's friends” must pass on their way to Paradise). The fifth dwelling is God's throne, and here follows a medieval vision of architectural perfection. The kranke karre and starke wagen of the final strophe are symbols open to many interpretations. Most likely, the precedence of the decrepit over the noble refers to the reversal of moral justice in this life, or the neglect of the true Church for a false one. Fegfeuer admits that he, too, cannot escape sin, and thus he lives a life of purgatorial torment. This Ton contains a total of 13 strophes, ranging over such disparate topics as politics, morals, the Virgin Mary, and tournements. Here, we have chosen the main idea: the conflict between good and evil, true and false, honour (êre) and disgrace or shame (schande). Kelin has opportunities to demonstrate his sarcastic and biting style as he sings of high-born hêrren who follow the Devil's teachings, and he warns the nobles against the flattering, ingratiating varnden. He yearns for the “old days”, when there was justice, and life at court was nobly virtuous. Today, he's ashamed to think of how scandalous courtly behaviour has become. The poet even stages a dialogue between “Lady Honour” and “Lady Shame”. The first reports that the situation in the world has deteriorated, and she would like to return to the virtuous God who sent her in the first place. “Lady Shame” laughs in scornful triumph, and boasts of having taken over the earth. She has taught almost everyone to be blind to virtue, and in all of Swabia there are only three honest men left. She has plans to conquer Bavaria and Vienna as well. Next, Kelin takes time out to sarcastically describe a false meister who is a “miracle-worker, steel-eater, fire-chewer and mountain-devourer” who also can “grasp shadows, on the silly fool!” But worst of all is the sin of suspicion, and the poet berates the enemy: the man who is suspicious of honour. The lack of peace and justice in the world is lamented, and Kelin emotionally remembers great leaders of the past, while warning the young noblemen to establish righteousness in accordance with God's law. To illustrate the effects of bad morals, Kelin retells the old fable of the greedy dog, who crosses a stream carrying a piece of meat in his mouth. Seeing his reflection in the water, and thinking it to be another dog with an even larger chunk of meat, he drops his own in order to grab the one he perceives, and thereby loses everything. As a finale, the Spruchdichter asks his listeners to send a message to his friend and patron, Volkmar von Kemenaten — one of the few remaining generous hêrren — telling of his present suffering and unpleasant living conditions. Filled with nostalgia, Kelin recalls the good old days at Volkmar's court. — Wolfgang von Wangenheim, Das Basler Fragment einer mitteldeutsch-niederdeutschen Liederhandschrift und sein Spruchdichter-Repertoire (Keim, Fegfeuer). Bern/Frankfurt 1972. — K. K. Müler, Die Jenaer Liederhandschrift (Faksimile). Jena 1896. — Helmut Tervooren/Ulrich Müller, Die Jenaer Liederhandschrift in Abbildung. Mit einem Anhang: Die Basler und Wolfenbüttler Fragmente. Göppingen 1972 (Litterae 10). — Georg Holz/Franz Saran/Eduard Bernoulli, Die Jenaer Liederhandschrift. I Getreuer Abdruck des Textes. II Übertragung, Rhythmik und Melodik. Leipzig 1901, Nachdruck Hildesheim 1966. — Helmut Tervooren, Einzelstrophe oder Strophenbindung? Untersuchungen zur Lyrik der Jenaer Liederhandschrift. Dissertation Bonn 1967. — Ermute Pickerodt-Uthleb, Die Jenaer Liederhandschrift. Metrische und musikalische Untersuchungen. Göppingen 1975. — Lyrik des Mittelalters. Probleme und Interpretationen. Hrsg. von Heinz Bergner. ll Die mittelhochdeutsche Lyrik (von Ulrich Müller), Die mittel-englische Lyrik (von Heinz Bergner). Stuttgart 1983 (Reclams Universal-Bibliothek 7897).